To move to sustainable development, decision-makers need information. They need information about where they are at the moment . . . information on developing trends and pressure points . . . information about the impacts or effects of interventions or policies put into place. They need feedback on which adjustments to make to speed up or slow down the effects of their interventions. They need information about milestones achieved or about failures that frustrate progress. Given the considerable uncertainty surrounding the definition of sustainable development, it should not be altogether surprising that measurement of sustainability has been somewhat problematic. As this unit will demonstrate, this has proved to be quite a convenient state of affairs for some less than ethical companies, because it has allowed them to exploit this uncertainty, and project a ‘clean, green image’, when in actuality, this is not the case at all – a practice commonly referred to as ‘greenwash’. This unit focuses on the latest state of play with respect to sustainability reporting in all its various incarnations, and reflects on what needs to be done if the flow of greenwash is to be curtailed. The main aim of this unit is to critically examine the current status of sustainability indicators in terms of their reach and their usefulness. This critique will involve tracing the historical development of sustainability indicators from the time they first emerged following the Brundtland Report, to debates surrounding the principles that should underpin any measurement or assessment of progress towards sustainable development, to present efforts aimed at integrated environmental assessment and reporting. 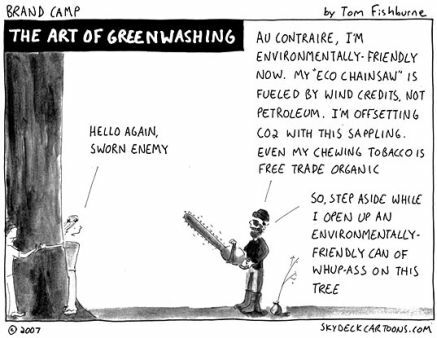 Outline and critique the extent of ‘greenwash’ and what must be done to prevent it. Given the many uncertainties of everyday life, we regularly face questions about the historical context of the current state of affairs and the likely direction of change in these affairs into the future. The great benefit of an indicator is that it helps us to quantify and simplify phenomena in order to better understand the complexity of reality. 5.1.1 Are all indicators useful? The answer to this question is that it depends very much on the relevance of the indicator to the phenomenon one is trying to measure. If this sounds to you like a statement of the bleeding obvious, you’d be quite correct, yet there exist many examples where indicators are used frequently but inappropriately. For example, while the use of the rate of GDP growth as a measure of the change in value of national output of goods and service from year to year is perfectly valid, it is less appropriate to use such an index to make judgements about the level of societal welfare. The IISD website Measurement and Assessment maintains up-to-date bibliographic details on the alternative indices that are emerging to make up for the shortcomings of GDP as a measure of societal wellbeing. Some of these indices will be reviewed in more detail later. IISD is a significant contributor to international discourse on sustainability measurement through its applied research. If you click on the Concepts and Principles link, you will get an idea of the theoretical underpinning of this research. The Bellagio Principles of assessment arose out a project undertaken by the IISD and funded by Rockefeller Foundation. There is no specific step-by-step process outlining how to create sustainable development indicators, rather the Principles are perhaps best looked upon as an overarching guide, which serves to provide a link between theory and practice. A point stressed on a number of occasions already in this course is that choices about sustainability depend very much on the political economy of a society. Different societies around the world will have much in common, but sometimes this commonality might be expressed in different ways. It follows, therefore, that when it comes to designing sustainability measuring systems, it is important to have an appreciation of the values, goals and aspirations of the target audience. However, this does not mean that constructing an indicator is all about providing people with useful feedback on issues they know about. It is also about providing information about issues that are central to sustainable development, but poorly understood; for example, ecosystem health and how this might impact on human health. Sustainability practitioners have to avoid falling into the same trap as the national income accountants. In Australia, the rate of change in the area of land affected by salination may be an important and appropriate measure for farmers in central Queensland, for example, but it is probably less significant to fishing communities in New South Wales. In short, a careful selection process is required to determine the indicator that is most relevant to a given context. This is the case whether it is a region, a sector of the economy, or an institution that is the focus of attention. During this process, indicators will be selected based on context-specific conditions but also on the basis of general selection criteria. Click on the Search the Compendium link and try the tool out for yourself. Think of a sustainability issue that impinges on your professional or personal life, and choose the relevant options from the various pull-down menus. Note well, the point of the compendium is not necessarily to find the perfect indicator, but to find one that might be adapted for another set of unique circumstances. Share and discuss your experience with classmates. The origin of sustainability reporting can be traced back to the State of the Environment (SoE) reporting that began to emerge in the aftermath of the Brundtland Report. A particular framework for environmental reporting systems has evolved incorporating such factors as the Driving Forces, Pressure, State, Impact and Response – the DPSIR model. Driving forces are the underlying human activities that lead to environmental change. They may be governmental activities such as agricultural subsidies, corporate activities such as the inefficient use of raw materials, or they may be consumer activities such as irresponsible disposal of waste. Pressures exerted on the environment and natural resources include increased pollution of air, water, and soil, or depletion of natural resources such as fish stocks. State describes the current state of affairs, and where data are available, shows trends in environmental quality over time. Impacts are the consequences of the pressures on natural resources, such as reductions in biodiversity, salination, or rising sea levels. Responses include current government policies and management strategies to combat environmental degradation, the effectiveness of these policies, and the recommendations for action to alleviate environmental problems. Follow this link to view the Australian State of the Environment (SoE) reporting website. In Australia, state governments also file SoE reports as well as the federal government. In New Zealand it is also common for territorial and regional authorities to submit reports. How do other countries compare? Discuss the progress (or lack thereof) of regions and countries around the world. To address the inadequacies of GDP as a guide for public policy, the GPI was developed in 1994 at Redefining Progress, a non-profit, non-partisan public policy institute, by Ted Halstead and Clifford Cobb. According to Cobb, Goodman and Wackernagel (1999), the conspicuous consumption of many societies reflects a carpe diem mentality instead of true progress; i.e. short-term prosperity is at the expense of long-term debts. To find out more about the GPI and how it is calculated, click on the following link, which provides details on the GPI for Atlantic Canada. From this web site, you will also find a link to the Canadian Institute of Wellbeing, which released its first report in 2009. The Ecological Footprint, devised by Mathis Wackernagel and William Rees, measures the amount of nature’s resources an individual, a community, or a country consumes in a given year. Official statistics are used to track consumption, which is then translated into the amount of biologically productive land and water area that would be required to produce this amount of output and to assimilate the wastes generated using prevailing technology. Click on the following link to find out about Ecological Footprint methodology. If you haven’t already tried, you may also wish to calculate your own Ecological Footprint. Also check the latest report on the size of your own nation’s ecological footprint. Is your country in ecological deficit or ecological surplus? Discuss this topic with your classmates. The pressure on businesses to produce sustainability reports has been steadily mounting over the last decade or so. Companies like Shell, Nike and Gap have all experienced the wrath of a consumer backlash as their poor corporate citizenship has come back to haunt them. But it is not only consumers that are demanding goods and services be produced by socially and environmentally responsible companies. Increasingly, the investment community is evaluating companies in terms of environmental risks and environmental market opportunities, leading to the emergence of indices like the Dow Jones Sustainability Indexes in 1999 and the FTSE4Good Index in 2001. Pre-dating the launch of these indices, the Global Reporting Initiative (GRI) was established in 1997 with the mission of designing globally applicable guidelines for preparing company-level sustainability reports. Do a Google search that includes the words: ‘FTSE4Good Index’ and ‘criticism’. Repeat the exercise for ‘Dow Jones Sustainability Indexes’ and ‘criticism’. Scan through the articles that these searches generate, and discuss your findings with classmates. Convened by the Coalition for Environmentally Responsible Economies (CERES), the Global Reporting Initiative has the active participation of corporations, non-governmental organisations (NGOs), business consultants, accountancy companies, professional associations, academics and other stakeholders from all around the world. During 1999-2000, 21 companies piloted the first draft of the GRI sustainability reporting guidelines. The GRI was officially launched as a permanent institution in April of 2002 at an event held at the United Nations in New York. It is now headquartered in Amsterdam, and the latest Sustainability Reporting Guidelines (referred to as G3) were launched in 2006. According the GRI, it is aware of more than 1000 organisations worldwide that issued sustainability reports based on the GRI G3 Guidelines for 2008; which is 46 per cent higher than in 2007. Visit the GRI website, and take a look at which companies are reporting, and which countries they are coming from. If you are persuaded by the merits of the GRI, consider actively participating as an individual or a member of your organisation. This will ensure that you keep abreast of the latest GRI developments, related conferences, opportunities for involvement, publications of interest, and so on. In this 1:57 minute clip, Alan AtKisson gives a talk on the virtues of the GRI. Refer now to Reading 5.1 by Milton (2008) that provides a succinct overview of the development of the GRI standards. Discuss your views and opinions of the GRI initiative with classmates. Some businesses view increased transparency through sustainability reporting as an opportunity to gain competitive advantage. The thinking, quite simply, is that increased transparency can strengthen a company’s relationships with its stakeholders and help identify areas where they can improve efficiency. However, while the GRI is becoming increasingly influential, the number of companies filing sustainability reports that use the GRI guidelines continue to be in a small minority. This notwithstanding, many companies acknowledge the increasing commercial importance of sustainability, and they are prepared to devote resources to it, but rather than embark on a strategy that makes sustainable development an integral part of their business processes, funds are allocated to the marketing department so that the company appears to have a ‘clean, green image’. This practice is commonly referred to as greenwash. View this 1:00 minute YouTube clip from MTV Switch 2008: The Green Song for a satirical view of the way the corporate sector is responding to the need to engage in more sustainable practices. Can you come up with a 1-minute clip that does a better job? Share your creative genius with you classmates! Refer now to the CorpWatch web site dedicated to the monitoring of the environment. Also take a look at the pages they have dedicated to greenwash. The term ‘greenwash’ is defined, and there is also a short article on the history of greenwash that may be of interest. Contribute to a discussion on any story that particularly catches your eye or, indeed, any other greenwash account that you have come across in your reading. Refer now to Reading 5.2 ‘Understanding and Preventing Greenwash: A Business Guide’, by Horiuchi et al (2009). This report, published by BSR, defines greenwash and then focuses on the perspectives of various stakeholders. It concludes with a guide on how to go about preventing greenwash. How widespread is greenwash in your opinion? Give an example that you believe is particularly blatant. Contribute to a discussion on this or any of the issues raised in this report. The main objective of this unit was to critically examine the current state of play with respect to sustainability indicators. There can no question about of the importance of elevating sustainability indicators because, in the words of Peter Drucker, “what isn’t measured, isn’t managed”. The state of the environment reporting that emerged after the Brundtland Report provided a useful impetus for sustainability reporting, and since this time, approaches have become more sophisticated as multinational, cross-sectoral efforts like the Bellagio Principles project and the GRI have served to provide guidance to businesses and other organisations. Clearly, though, much remains to be done, and it would be fatuous to assume that sustainability reporting is an ‘advanced science’. Indeed, greenwash is likely to prevail so long as the ecological consciousness of the majority of businesses remains underdeveloped of non-existent. Greenwash; the DPSIR model; state of the environment (SoE) reporting; the Bellagio Principles; the Genuine Progress Indicator (GPI); the Ecological Footprint; Dow Jones Sustainability Indexes; FTSE4Good Index; the Global Reporting Initiative (GPI). Bennett, M. and James, P. (1999). Sustainable Measures: Evaluation and Reporting of Environmental and Social Performance. Sheffield: Greenleaf Publishing. Cobb, C., Goodman, G. S. and Wackernagel, M. (1999). Why Bigger Isn’t Better: The Genuine Progress indicator – 1999 update. Oakland: Redefining progress.